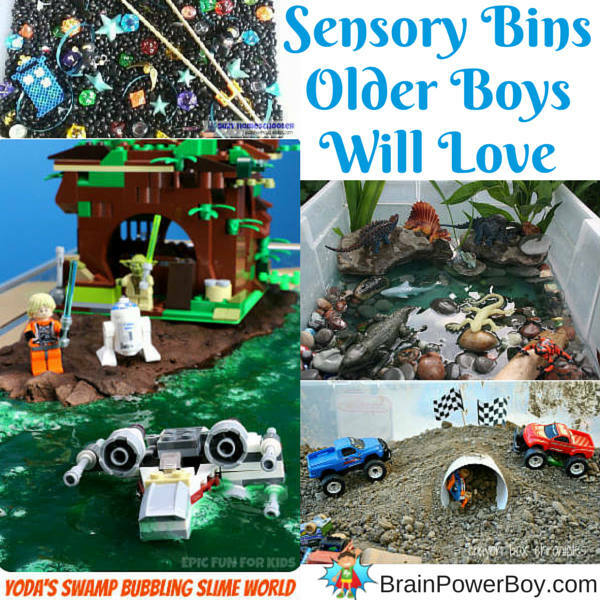 Sensory bins are great for boys’ learning and because boys like them so much I thought it would be a good idea to take a look at them as a hands-on learning option for your boys. These are great to set up and just let your boys play. They can also help plan a bin! Read on to see what they learn and find some awesome sensory activity ideas for boys. So, what exactly is a sensory bin? Well, each bin is different, but basically it is a container of some sort—usually of the Rubbermaid variety–that is filled with a filler such as rice, beans, sand, cotton, slime, water etc. What is added to that depends on the type of bin you are creating. You can add things like scoops, blocks, small plastic figures , sticks, rocks, gems, coins , treasure, cars, LEGO, you get the idea! The wonderful thing about creating these bins is that you can do it on your own and use your creativity to make a bin you know would be perfect for your boy. You can also use the ideas below as a starting point and make a bin just like the ones shown. Or work with your boy to let him create a bin all his own. Let’s not forget the word “sensory” in sensory bins. The bins introduce or let kids explore their senses as well. If you want to know more about sensory bins and learning there is a very good article on Suzy Homeschooler that explains not only bins, but also the importance of play. Sensory bins can be used for just about any subject you are covering, or that your boy is working on at school. You can also use them for topics your boy is interested in. Interest-based learning works very well for many boys. Note: Use common sense when filling your bins. You know your boys better than anyone else does. You know if any of the items that you choose to put into your bin would be a choking hazard and/or cause an allergy issue. Space Melt! This should be an easy one to throw together with toys you likely already have in the house (if you need space guys–we like these ) Just check with your boys first—some young boys might get upset if they see one of their favorite space figures trapped in a block of ice! I would add a salt shaker so they can see what happens if they put salt on ice. Take this idea and run with it. You can use all types of different figures to put into the ice block. I’m thinking this arctic set would be neat too. Pirates are a favorite topic around here. I found this pirate sensory bin that was made with rocks and water beads. The storytelling aspect of this bin is what drew me to it. It is very neat! Be sure to see our pirate books and our pirate homeschool unit study for activities if your boy is a pirate fan. —appropriate right? and made some munching machines. It’s a good one. If you try this out with older kids (and I would) then when they are about done messing around with the bin, ask them what they think they could make with the pieces in the bin. Throw in some paperclips, tape and binder clips, and let them have at it. Down on the farm includes animals, straw, and corn. There is a balance included which I think is a very good idea. We did so much with our simple little balance and my son certainly learned a lot from playing around with it. (see our choice below) You could also use a scale to weigh things. This construction sensory bin is sure to be a hit. Grab some of the smaller construction vehicles, sticks, rocks, figures, blocks and some sand (could also use beans) and let them play, play, play. Let’s put on our hardhats and go mining for magnets! So simple and yet you can learn so much from playing with magnets. Set this one up very quickly for some fun magnet play. Add whatever magnets you have or try the set at the bottom of this post. Sensory bins can be used for boys of all ages. Here are a few that I know older boys would enjoy. Please do not think they are “too old” for this type of open-ended play. I assure you, they are not. I have seen boys as old as 15 dabbling with things in a bin for a while. You just have to add the right things. A good resource for materials for bins for older kids is this article on sensory play from my friend Anna at In the Playroom. Her list actually covers ages 0 – 10 but I am particularly fond of her choices for the 5 – 10 age group. This is totally cool! 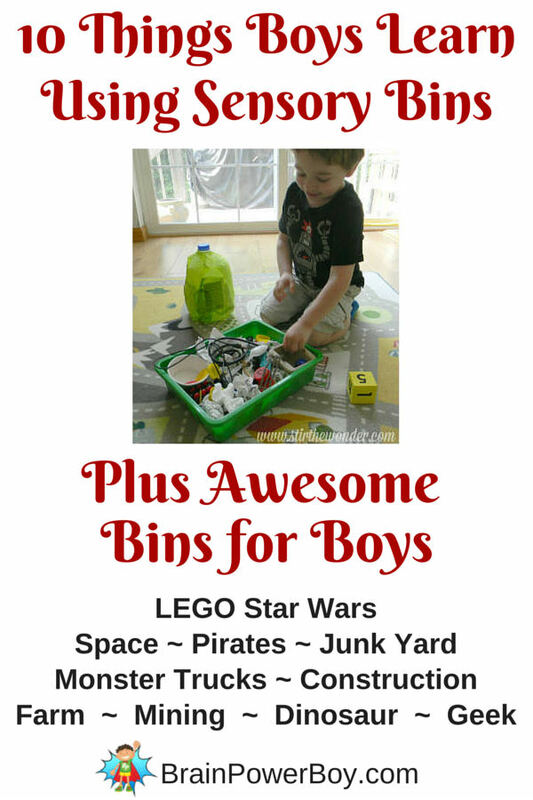 Older boys will enjoy the topics of this Geek sensory bin with Star Wars, robots, Dr. Who, Harry Potter and ninjas. I think older boys would enjoy this one as well. LEGO & Star Wars plus green bubbling slime—um yeah, pretty hard to resist. You know I couldn’t leave out dinosaurs, right? There are plenty of learning opportunities here. The bin includes plants (love that!) water, dinosaurs, reptiles, and rocks. Read some dinosaur books, study plants, go on a rock hunt, and play with the dinosaur bin—Fun! If your boy is into trucks, you really have to give this one a go. Monster truck sensory bin is a bit more work to set up, and a bit messier, but it is worth it. One thing we have done to add some learning with cars and trucks is to have races and break them down by heats to find the big winner. Here are some great items to add to bins. Click the images learn more. Many boys are very fond of hands-on experiences. They like to touch and feel things. They like to “do” instead of just watch. You can take almost any subject and inject some learning fun into it by simply using a sensory bin. The great thing about these bins is that they are so memorable. Boys love them and want more of them! Because they enjoy them so much they are more likely to remember the topic you are sharing with them. 9 Dinosaur Activities for Toddlers and Their Big Brothers includes more sensory bins. Love this round up! So many things can be learned from sensory bins! Thanks for including our Junkyard Sensory Bin, it’s one of our favorites! You are most welcome. I love that sensory bin and the garbage munchers are so neat. Sensory bins are so much fun for kids, they don’t even realize how much they’re learning from them! I love that construction site one! Emma, I agree. They are a lot of fun and they learn so much. Hard to pick a favorite 🙂 Glad you like the construction one. Sheila, these are GREAT! Fantastic round up. We’ve done the freeze a figure, marbles, etc in a block of ice and then my kids ‘rescue’ whatever is inside. Actually, just this past week my daughter asked to freeze things 3 times in one day!! Can’t wait to try more sensory bins with my 9 year old. Obviously, we do more with my 4 year old but your post helped me realize that my son can still enjoy a sensory bin/activity! Wow, I never thought to use sensory bins with older children. I think my boys would love a Star Wars themed one! Love these ideas! We just bought a water table for the kiddos so we can do more sensory play. Right now it’s full of pasta and rice and they’re having fun filling cups and dumping them out again. I’m going to make some notes from these ideas so we can try something a bit more creative when the chaos of Christmas is over! Oh, that is great Clare. Those water tables are very neat and you can do so many types of bins in them. I certainly don’t blame you for starting with pasta :)! I see sensory bins mentioned all the time, but have yet to create any for my two boys. I know they would love them and it’s my goal for the new year to create some better learning activities for them. Thanks so much for stopping by and for leaving a comment! I never used sensory bins with my kids when they were younger – didn’t know about them as a wasn’t a blogger. I so wish I had found out sooner, some amazing ideas, and so much learning too! Thanks for sharing with the Parenting Pin it Party! We did use the general idea of them but not everything contained in a bin. I agree that had I seen some of these earlier, I would have been glad. Thanks for your work on the Parenting Pin It Party. 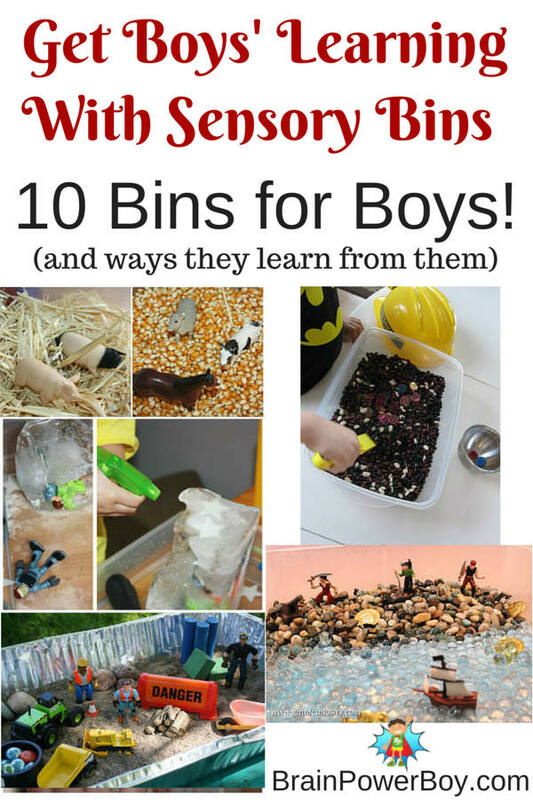 Such a fabulous collection of sensory bin ideas for boys! Thank you for sharing on my facebook page. Thanks Suzie. Very nice to hear from you and I am so glad you like them. Boys and “sensory” just go together, don’t they! Actually, next week we are doing D is for Dinosaurs in our preschool class and we are going to use some of these ideas! Yay, I am so happy to hear you are going to use some of these ideas in your class Sinea. I hope everyone has a lot of fun with them. Be sure to take a look at a guest post by the lovely Clare from The Super Mommy Club. It has a lot of wonderful dinosaur things in it that are perfect for that age group. Dinosaur Activities. I adore this post 🙂 my son loves sensory bins, we are going to have to try these! Thank you so much Katie! I hope your son enjoys the bins. Thank you for taking the time to comment and stop by. It is much appreciated.